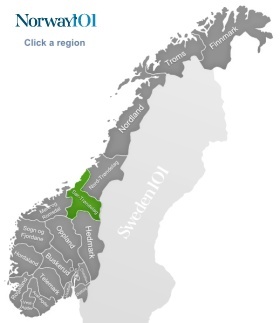 Sør-Trøndelag as a region with that name only existed since 1919 – but of course the history of the people of the land goes back a lot further, it simply had a different name (Søndre Trondhjems amt). And even further back, the Southern part of Trøndelag was not separated from the Northern part as it is today. Thanks to Trondheim, which was Norway's old capital, Sør-Trøndelag is a region filled with history, and you can see many signs of life in the past in this region of Norway. It is also one of the regions in which you will meet tourists, especially in places like Trondheim and on the Trondheimsfjord. Sør-Trøndelag is not only a place of beautiful landscapes, it also is a region that was on many important pilgrimage routes, and it used to be important for trade and mining. You'll be able to find old churches, new churches, abandoned mines, and old fortresses in various places in Sør-Trøndelag. Trondheim used to be Norway's old capital (until 1217), and even to this day it is the place where new kings receive a ceremonial blessing, after all, the city was founded by King Olaf, one of the most famous kings in Norwegian history. In the past, many different pilgrimage routes ended in Trondheim, so it's only logical that it's a great place to see a cathedral and a variety of old churches in various states – from ruins to well-kep medieval churches and some examples of modern architecture, too. The river Nidelva makes its way through the city and is a great place for a relaxing walk. There are some lovely old town bridges across the river, and they are worth a look, too. Trondheim used to be a very important center of trade in the past, and today, you can learn a lot about the history of Norway in the various museums of Trondheim. Trondheimsfjord is Norway's third longest fjord, and can be accessed from various places in the region. A good way to see Trondheimsfjord at its best is to take one of the many boat cruises on the fjord, but you could also hire your own kayak or canoe and paddle along at your own pace. It passes Trondheim on its way, and then moves on further North. There are also some reasonably sized islands in the fjord. You might not really want to fall into the water though because in the past, four giant squids have been found in the Trondheimsfjord, and it might not be too pleasant an experience to land on one of them. Røros is a UNESCO World Heritage site and used to be an important mining town in the past. After 1644, the year in which copper ore was discovered in the nearby mountains, the town grew and more and more mining happened. People from all over the place came to work in Røros. Today, visitors can go and visit two of the mines, and even take tours down into the mines Nyeberget and Olavsgurva. Olvasgruva is the younger of the two mines from the year 1936, and Nyeberget is from the year 1650. If you have the time, it is a good idea to have a look at both mines to see whether you can notice the difference between the two. In some places in Dovrefjell, a mountain range, you can feel like you took a trip back in time. The mountain range was very busy in the past because it was an important route from Eastern Norway to Trondheim, the old capital. This is why many mountain inns were built in the past – so that weary travellers could have a drink, a good meal, and a place to sleep during their journey. You can even find the ruins of an old leper colony in the mountains. Of course, it is all a bit different today because roads make it easy to travel from one side of the mountains to the other. The Dovrefjell today is mainly interesting because of its diverse wildlife, the great hiking opportunities, and the elements of history you can find when you look for them. The Femundsmarka National Park is one of the national parks in this region of Norway, and worth a visit. It's mainly a wet landscape, i.e. there are many lakes and plenty of marshes (so you want to watch your step, too, and don't get off the path). The park is known for its population of falcons and reindeer. The park doesn't have very impressive forests, but it is an experience in itself. Some people say that the landscape of this park reminds more of Sweden than of Norway.